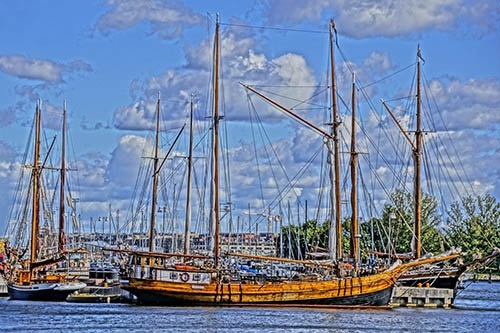 Tall ships, like these in Helsinki harbor, maintained trade links between the Baltic countries during Hanseatic days. ABOARD THE EURODAM — There are two opportunities to visit Germany on this cruise, going east with a stop at the port of Kiel, and returning with a stopover at the seaside resort town of Warnemunde. From these ports there are excursions to some of the historical Hanseatic League cities including the old red-brick town of Rostock; Hamburg, Germany’s second largest city featuring an international maritime museum; Wismar, founded in 1229: and the Old Town of Lubeck, the Hanseatic capital once known as the Queen of the Hanseatic League. Charlottenburg Palace commissioned by Sophie Charlotte, wife of Prussian King Friedrich I, in 17th century. In the mid-thirteenth century, cities in North Germany attracted merchants, craftsmen, builders, traders, and sailors that organized to form guilds, or hansa, with the goal of establishing trade relations with towns around the Baltic Sea especially in the less-developed eastern Baltic. 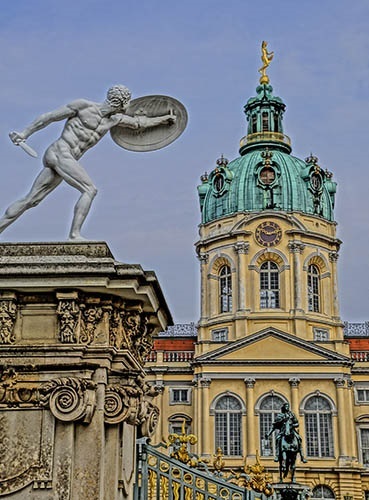 The Hanseatic cities shared economic interests and raised their own armies for common defense, sometimes using their commercial ships to carry soldiers and arms. Up to two hundred towns and cities throughout the Baltic and North Sea regions, as well as several large trading houses, became members of this Hanseatic League. For over 400 years, the Hanseatic League played a major role in shaping economies, trade and politics, before declining in significance during the seventeenth century. 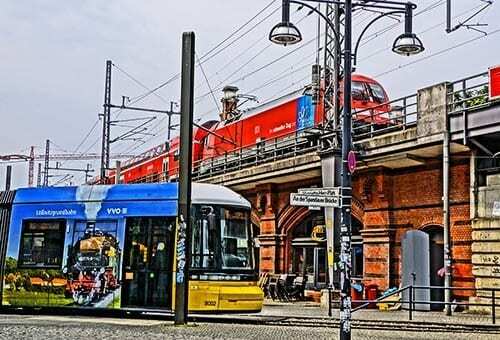 An optional choice to Hanseatic cities and a few other locales in the vicinity of Warnemunde is to join a tour that makes the six hour round trip by train or bus to Berlin for about six hours of sightseeing, minus time for lunch and WC breaks. Berlin seems to be a city in search of its spirit of place. With so many horrors that the citizens are intent not to forget, but undoubtedly feeling great discomfort in living with the memories of a tumultuous 20th century, it must be a burden quite difficult to bear while moving the metropolis forward into the 21st. 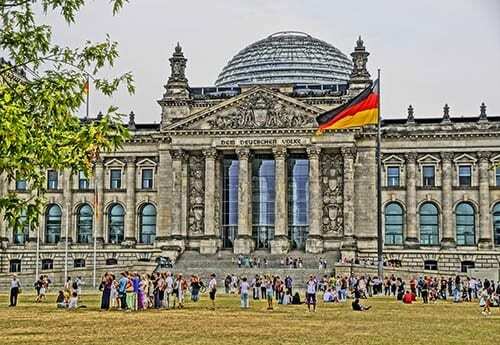 The Reichstag, seat of Germany’s parliament. A relatively young city by European standards, Berlin lacks the classic architecture of other cities, especially due to so much of it being destroyed in WWII. The only palace that survived the war mostly intact is Charlottenburg, the residence of Sophie Charlotte, wife of King Friedrich I when Berlin became capital of the first Kingdom of Prussia in 1701. However, after you’ve seen Catherine the Great’s place in St. Petersburg, a visit there may only elicit a passing glance. Colorful S-bahn train and a street tram passing at a Berlin transportation hub. 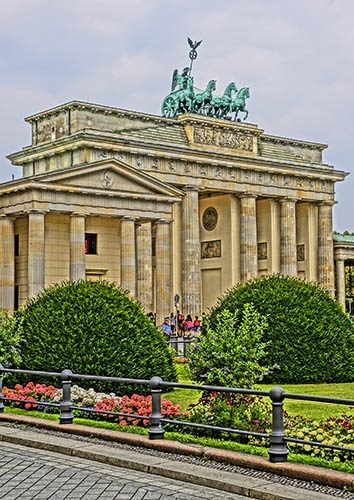 Of course, a six-hour stay in Berlin permits time to visit only the iconic sites, such as the 18th century Brandenburg Gate, a remaining stretch of the Berlin Wall that has been turned into a memorial museum, the Reichstag Building, and Checkpoint Charlie. Additional points of interest, such as the 1,207 foot tall TV tower, St. Mary’s Church, “Red City Hall,” and random street scenes, can only be viewed in passing and photographing them involves skill in doing drive-by shootings. 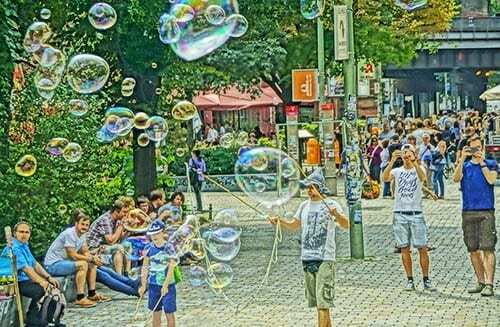 Bubble makers in Berlin park. Perhaps if there is a new evolving spirit of place developing in resilient Berlin it could be in Potsdamer Platz. Formerly a wasteland with the Berlin Wall dividing it, this central site for a rebounding Berlin has attracted some of Europe’s premier architects. As headquarters for multinational corporations, such as Sony Center, and as an emerging center of the world’s film industry, this expanding plaza already boasts more than one hundred shops, restaurants and bars, plus an amusement park.